After enjoying the epic trilogy there was one more of Brandon Sanderson's Mistborn books to read. This one is set three hundred years after the last one, and the world has come a long way. The world of the first three books is the stuff of legend. The characters I got to know so well appear now in place names, religion, turns of phrase and in one case, as a bogeyman. Eastern street slang reappears in an interesting way - I won't ruin that for you, but it made me laugh. Instead of epic fantasy this book is a mash-up of fantasy, western and detective. I appreciated the genre mixing, it was well done, and a good genre mix is something I often enjoy. The epic scope of the earlier trilogy is gone, though with a revelation at the very end I began to wonder if that might return. I thought the scope of this book worked well, so I am uncertain as to whether I'd welcome this new setting taking a turn for the epic. The map at the beginning of the book is well worth examining, it's very interesting to see how things have developed since the end of the trilogy. Place names such as Elendel, Rashekin and Hammondar Bay were highly amusing. I imagine you could read this book without reading the trilogy if you wanted to, but I got a lot out of knowing what had come before, and having quite a bit more understanding of certain things than any of the characters appear to have. The magic system has evolved with time and the dilution and crossing of bloodlines. The strongest variants seem to have largely disappeared but different combinations of skills allow all kinds of things that weren't possible before. Some established gaps in knowledge from the trilogy have been filled in, but knowledge has also been lost, consequently I was able to gain insight that it's clear the characters couldn't. I found this particularly interesting. In a more epic book I think I'd miss some of the things that are gone but with the story here operating on a smaller scale it was probably best not to have these. The only significant nitpick I'd have with The Alloy of Law is the main character's name. One of my pet peeves are names that have ambiguous pronunciation (or conventional names with bizarre spellings). I find they distract me from focusing on the rest of the story and ruin my ability to fully immerse myself. Many invented fantasy names are fine - Vin, found in the first three books, is not a problem. Waxilliam, on the other hand, is. The protagonist has a very serviceable nickname, Wax, but while this was used extensively in dialogue it was not generally used in the rest of the text. I would have liked to see Waxilliam reserved for formal use as it would have made things a lot smoother. On the whole I enjoyed this book. It was a total change of scope, but as it is clearly a totally new story arc this isn't a problem. It was a lot of fun in a well thought out setting. 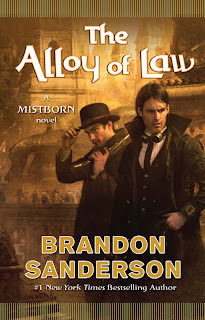 Although there is no release date set Brandon Sanderson's blog indicates that there will be a sequel to this book. I'll keeping my eye out for it, it will be very interesting to see where things go from here.